Senegal’s army spokesman said its troops have entered Gambia to ensure incumbent leader Yahya Jammeh cedes power to the country’s newly inaugurated president. A West African regional force, including Senegalese troops, had been poised on Gambia’s borders and moved in on Thursday, shortly after the UN Security Council expressed “full support” for Gambia’s new president, Adama Barrow, and called on Mr Jammeh to respect his election loss. Mr Barrow was inaugurated in a hastily arranged ceremony in Gambia’s embassy in Senegal shortly before the UN vote. Mr Jammeh has not been heard from since his mandate expired at midnight. The UN Security Council unanimously adopted a resolution that expressed “its full support to the Economic Community of West African States (Ecowas) in its commitment to ensure, by political means first, the respect of the will of the people of the Gambia as expressed in the results of December 1st elections”. West African troops had been poised to intervene in Gambia after president Jammeh’s mandate expired at midnight on Thursday and overnight talks to convince him to stand down failed. Senegal has deployed hundreds of soldiers to its shared border with Gambia and Nigeria has pre-positioned war planes and helicopters after the Ecowas said it would remove Mr Jammeh if he did not hand over power to Mr Barrow, who won an election in early December. Gambia’s capital, Banjul, was quiet overnight and on Thursday morning as military helicopters flew overhead and police trucks patrolled largely empty streets. Mauritanian president Mohamed Ould Abdel Aziz led last-ditch talks with Mr Jammeh in Banjul on Wednesday before meeting Senegal’s president Macky Sall and Barrow in Dakar overnight. It was unclear what Mr Jammeh’s next move would be. The veteran leader faces almost total diplomatic isolation and a government that has all but collapsed from defections. Both Ecowas and the African Union have said they will recognise Mr Barrow as president from Thursday. “It is absurd,” Mr Barrow’s spokesman Halifa Sallah said in a press conference on Wednesday. “The clear position is that the president-elect should assume office on the 19th”. A spokesman for Nigeria’s president had told the BBC that troops would only intervene on the request of Mr Barrow once he had been sworn in. 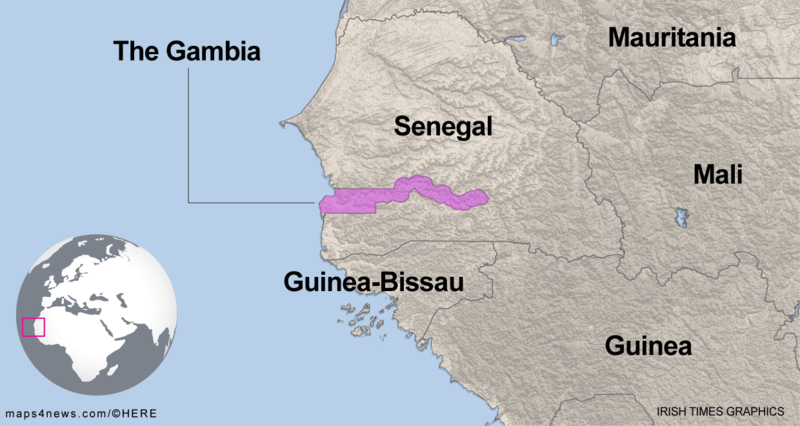 “What the Senegalese said about the midnight deadline was to put pressure on Jammeh. It was a show of muscle,” a diplomat in the region told Reuters. The UN said at least 26,000 people fearing unrest in Gambia have fled to Senegal and tour operators have sent charter jets to fly hundreds of European holiday-makers out of the country. In Ireland, the Department of Foreign Affairs updated its advisory for the country on Wednesday, warning people to avoid “non-essential travel”. Mr Jammeh, who took power in a 1994 coup and later vowed to rule for “a billion years”, has so far ignored calls by world powers and regional leaders to step aside and avert a conflict. He says the electoral commission was under the influence of “foreign forces”, and has challenged the result in a court - which currently has no judges to preside over it. Gambians celebrated in the streets when Mr Jammeh conceded electoral defeat to Mr Barrow, a real estate developer who once worked as a security guard at an Argos store in London. But a week later, the president changed his mind. It was the latest in a long line of eccentricities from a leader who had said only Allah can remove him from office, claimed to have a herbal cure for Aids that only works on Thursdays and threatened to slit the throats of homosexuals.